All Coupons for this contest must be posted to THE SPORTSMAN Goes, Holland, on or before Saturday (Midnight) May 16th. 1908. Cricket Coupons received after Monday May 18th are liable to disqualification. £ 250 for 8 CORRECT. SEND EARLY AND WIN A PRIZE! THIS COUPON WITH REMITTANCE MUST BE PSOTED TO THE SPORTSMAN, GOES HOLLAND, with 2 1/2 d, STAMP, NOT LATER THAN MIDNIGHT SATURDAY MAY 16TH 1908, IT MAY BE DISQUALIFIED IF RECEIVED LATER THAN MONDAY EVENING MAY 18th 1908. For matches played May 18th. and 21st.1908. No 2. Season 1908. £250 for 8 correct forecasts. £100 for 7 correct forecasts. Should no Competitor give 8 the £350 falls to those giving 7 correct forecasts. How to fill up the coupon and win a prize. Read Carefully. The clubs, forming the 8 matches, the result of which you have to correctly forecast, are given below, and are numbered at the side 1 and 2. If the competitor select, the first named club as the winner of the match, he must put the figure 1 in the square provided opposite, or should he select club No.2 as the winner, he msut place the figure 2 in the square. Where he thinks the result of the match will be a draw, he msut place X in the square. You can fill up as many columns as you desire. make your figures distinctly. Cut here and send bottom portion keep the top portion with the conditions at the back. 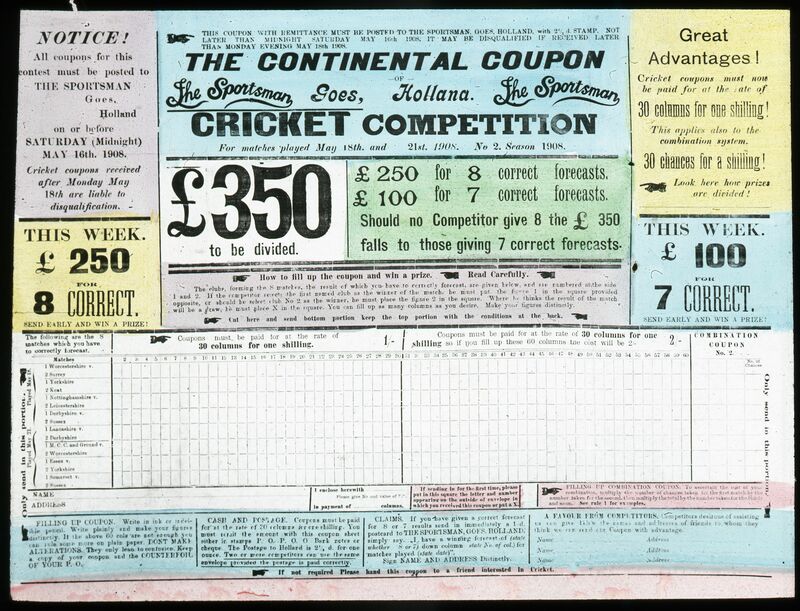 Cricket coupons must now be paid for at the rate of 30 columns for one shilling! This applies also to the combination system. 30 chances for a shilling! Look here how prizes are divided! £100 for 7 CORRECT. SEND EARLY AND WIN A PRIZE. Played May 21. Played May 18. The following are the 8 matches which you have to correctly forecast. 1 M. C. C. and Ground v.
Only send in this portion. Please give No and value of P.O. in payment of ... columns. If sending in for the first time, please put in this square the letter and number appearing on the outside of envelope in which you received this coupon or put a X. FILLING UP COMBINATION COUPON. To ascertain the cost of your combination, multiply the number of chances taken for the first match by the number taken for the second, then multiply the total by the number taken for the thirds and so on. See rule 1 for example. FILLING UP COUPON. Write in ink or indelible pencil. Write plainly and make your figures distinclty. If the above 60 cols are not enough you can rule some more on paper. DONT MAKE ALTERATIONS. They only lead to confusion. Keep a copy of your coupon and the COUNTERFOLD OF YOUR P.O. CASH AND POSTAGE. Coupons must be paid for at the rate of 20 columns for one shilling. You must remit the amount with this coupon sheet eitherin stamps P.O.P.O.O. Bank notes or cheque. The Postage to Holland is 2 1/2 d. for one ounce. Two or more competitors can use the same enveolpe provide the postage is paid correctly. CLAIMS. 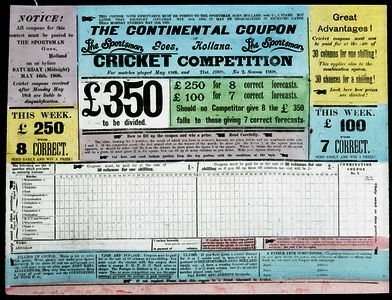 If you have given a correct forecast for 8 or 7 results send in immediately a 1 d. postcard to THE SPORTSMAN, GOES HOLLAND; simply say "I have a winning forecast of (state whether 8 or 7) down column state No of col.) for matches played (state date)". Sign NAME AND ADDRESS Distinctly. A FAVOUR FROM COMPETITORS. Competitors desirous of assisting us can give below the names and addresses of freinds to whom they think we can send our Coupon with advantage.